So I may have become a KAL addict. 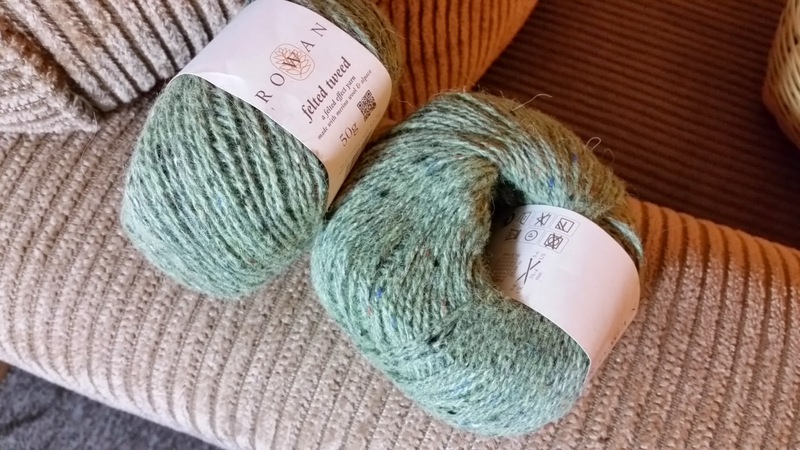 In my attempt to focus more on using my stash and less on buying yarn I have signed myself up to 3 KALs(this one is included). I can't seem to help myself. 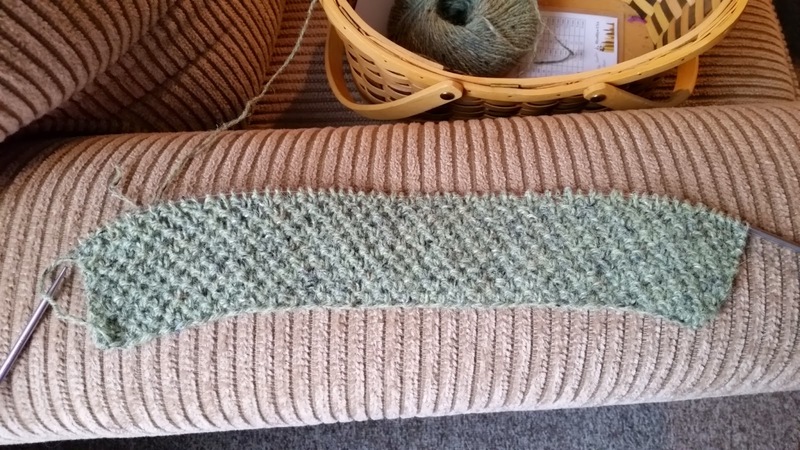 The good news is that I am turning a corner both figuratively and literally on the Ashby on I did the short row turn and am on to Chart D. I don't know if my gauge is off or if this is going to grow a bit but it seems a bit small to me. It will be fun to watch and see what happens. I'm headed on a yarn-cation next week to see the "Interpretations 2" trunk show next weekend in Portland and take a couple classes with Joji; I'm hoping I can make some good traction on my Ashby. Jason is officially there as of today! Long road trip ~ quite a story already but I'll wait to share it til he's back. He sent me this photo within a half hour of pulling into town ~ he in his custom made Richard Sherman jersey and his new 'friend' in her custom made Tom Brady jersey. and that's just the first 2 days...they're not even halfway through their trip. I had a secret project to work on, so Ludlow had to take a back seat for a bit. Now that the SP is done, I have returned to Ludlow...well, some of the time. Last night I lost several hours of work when I realized that I had worked the most recent section in seed stitch, instead of the moss stitch in the pattern. As you can see, I'm back on track now. There's something about the self-imposed restraint to basic knit-purl combinations that intrigues me about this knit. It's a stretch for me, but in a good way. It's like giving a child a toy that is simple and restrained; it fires up the imagination, instead of dulling it with flashy gizmos. Working on this scarf this morning took me back to a swatch that I did about a year ago for a personal design I've been dreaming up. 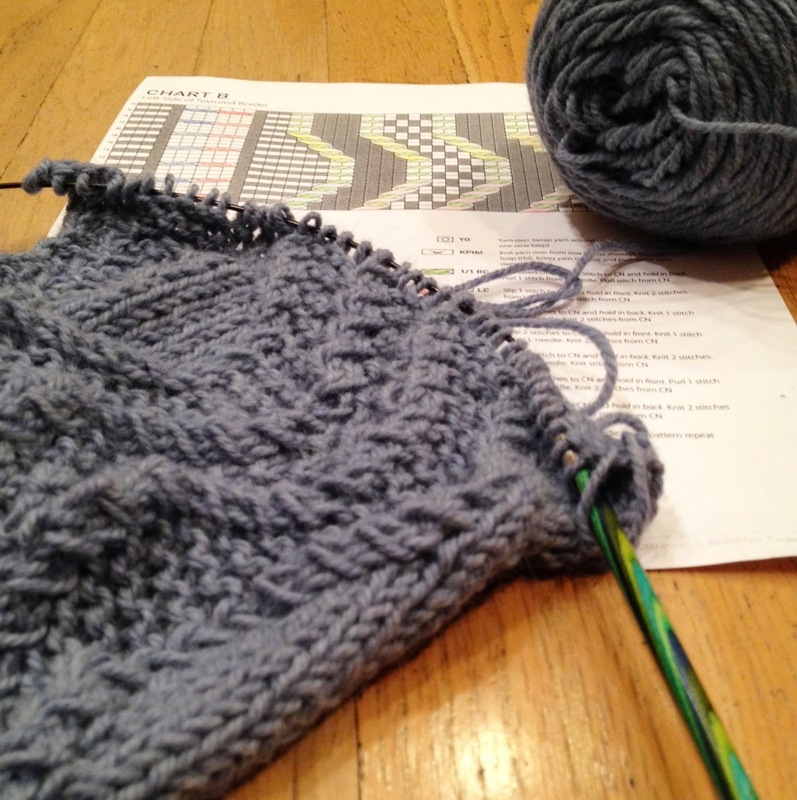 Eager to take that design to the next level, I decided to put down Ludlow and try to find an appropriate yarn. I found something that might work, but it was the wrong color. I ran with the sidetrack to figure out how to overdye the yarn; it's cooking on the stove as I write. So the takeaway is that Ludlow's going to be taking me a while. If you're feeling slow, don't worry. Slow is good; you're in good company. Hello all! I have been contemplating the KAL for a little while. I being a lover of all things Brooklyn Tweed and a devoted member of Flood's Flock I wasn't 100% sure what pattern or direction I was going to go with this KAL. I love this group and I know I had to just pick a pattern. I have already made an Ashby a few years ago....but after the first repeat I had realized that I wasn't reversing the symbols for the right and wrong side. I not being a fussy knitter just continued doing it wrong :) I'm relaxed like that. I figure as long as I was consistent than it was okay with me. However I have always wanted to make the correct version of the Ashby. But on the other hand...... I really don't need another shawl. What I do need is a cardigan......... which led me to play with my current already done (modified) Ashby on my form. I thought I can totally un-invent this pattern into a cardigan. I know it would make both Elizabeth Zimmermann proud and I think even Mr. Flood himself wouldn't have a problem with it. So this one will stay a shawl. I am using Fiber Company Canopy WW-Orchid. 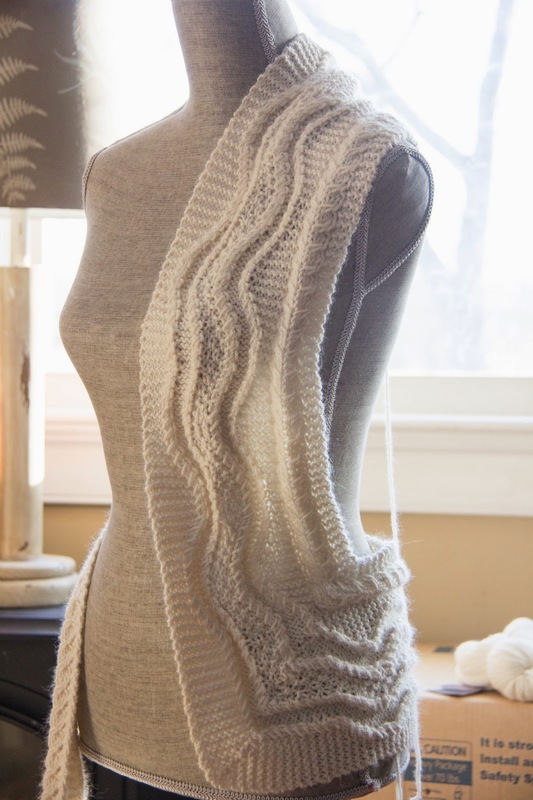 It is 50% baby alpaca, 30% merino, 20% viscose bamboo and OHHH so lovely to work with. I'll try to share as many notes as I can when I finish it, but for now I'll say I am doing the edging and I turned it twice so the angles lay on my hips and the panels run up both sides like a button band. The back will be done in the same texture as the shawl. I think I am going to include some pockets in it and I'll keep my fingers crossed that I have enough yarn to finish!!! I did it, I cast on Ludlow instead of Stonecrop and it is a much smoother ride for me. 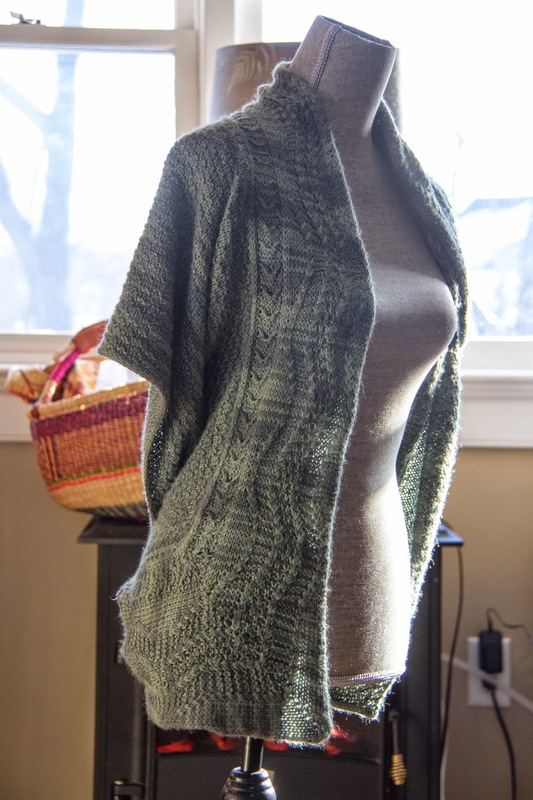 I am using re-purposed Fishermen's Wool from my stash (ironically it used to be a sweater from a Jared Flood pattern I made for my husband, but somehow he did not dig it and managed to get a whole into it, etc. so I decided to undo it and use the yarn for my own dark purposes - insert crazy cackle here). Special request from Jason....12th Man Beer Can hats for the boys' roadtrip to Arizona (they are Superbowl bound!!!). So highbrow, cough cough, but every fan needs one, right? We spent the weekend with my mom and these hats were a true group effort ~ I cut the cans into pieces and did the seaming, Jason punched all the holes in the aluminum, my mom used her mad crochet skills, and Dozer supervised! They were a blast to make ~ sorry I can't share a recipe but we fudged these caps from beginning to end ~ they're freeform and custom fit. There are tons of patterns out there, though...we just couldn't find one that suited our vision. I think they turned out fantastic. Jason thinks they are perfect, so that's all that matters anyway. Note to self - when working against a deadline, make sure to allow time for the beer to be imbibed. Sadly, this surprisingly tasty beer went down the drain except for a few small glasses. Boo. Hoo. taller] and I don't want it to be too long. I want to knit for myself. Finally got around to joining the two thousand plus knitters who have tried the classic 'Turkish Bed Socks' pattern by Churchmouse Yarn and Teas. Fun. Fast. Easy. A little more seaming than the average joe might like but I love doing the finish work on a project so it was a bonus for me. Yarn was a gift from our own WillyG (thanks, Will!). I'll be knitting these again with some modifications to see if I can make the ankle a bit more snug and add some pizzaz to the foot. Love these. 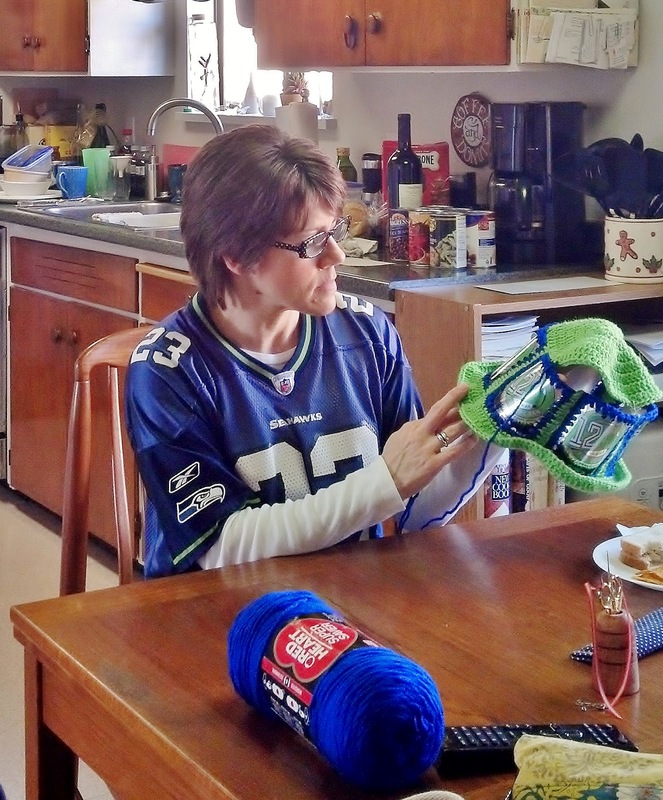 Today we're off for a visit with mom to see if her mad crochet skills can fashion a Seahawks 12th Man Beer Can hat for Jason before Superbowl Sunday next week. Wish us luck! We're also lucky that the owner had decided to give him away ~ Dozer was from an 'oops litter' (a neighbor's black lab mix had gotten loose and had a fling with Dozer's mama...a purebred Springer Spaniel). He was one of thirteen puppies (!!) and the Spaniel's family had let his twelve siblings go to other families but had kept Dozer for themselves...and then decided that a third dog and a new baby didn't really mix. 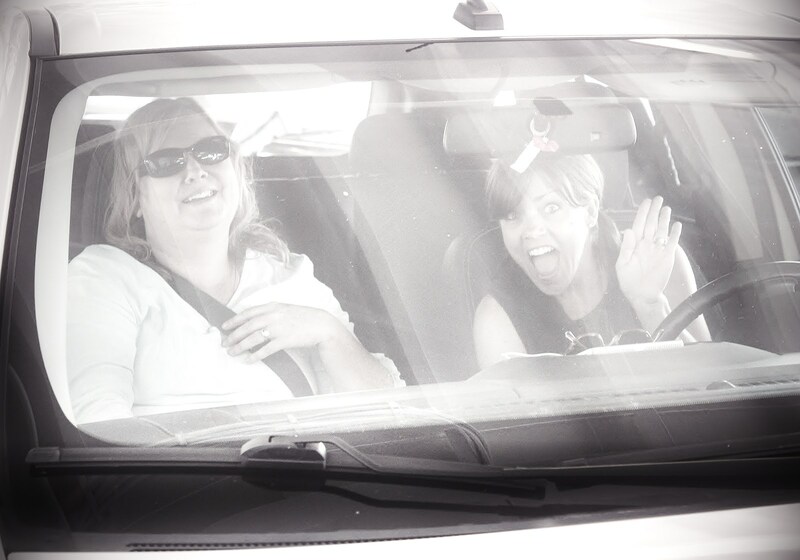 Sometimes timing really is everything. They let him go and we needed him and he's brought us much joy ever since. So happiest of birthdays, Stinky Pinkerton! The good news is that I'm really, really close to finishing Girasole. I've sucked it up and cranked out the knitted on edging as though I don't know what the word "boredom" means. Now for the "Oh, crap" part. 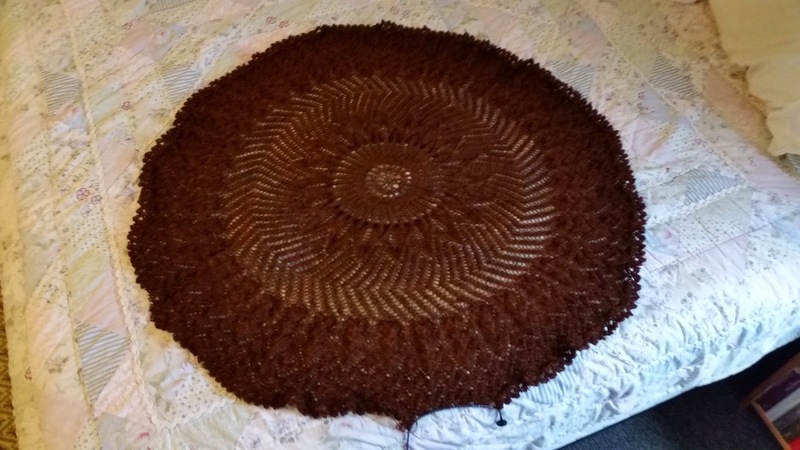 I was working along yesterday afternoon, hoping to have Girasole ready for the blocking mats today, when I realized - I don't have very much yarn left at all. In fact, I may not have enough to finish! I got down to 22 edge stitches when the yarn ran out. So close!!! 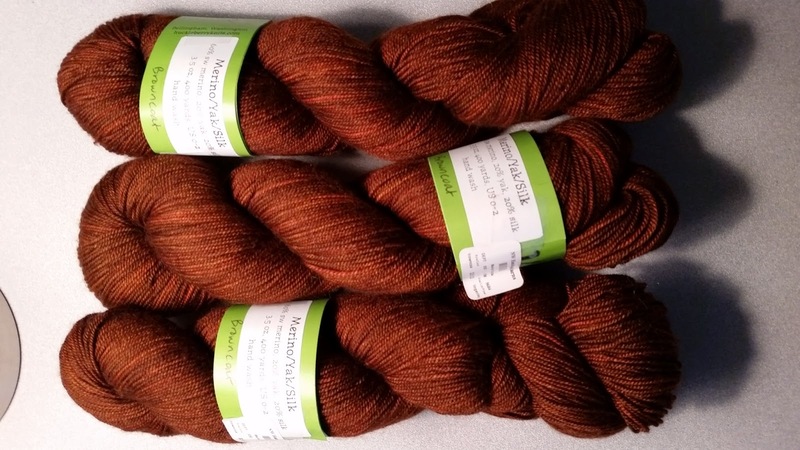 I'm currently waiting for Scarlet (Huckleberry Knits) and the wonderful folks at Northwest Handspun to give me a call to let me know if there's any more Merino/Yak/Silk in Browncoat in the area that I can get for love or money (preferably money). If the answer is no, I'll need to deconstruct Girasole and re-knit her on slightly smaller needles. I can't say that it would break my heart to have to do this. 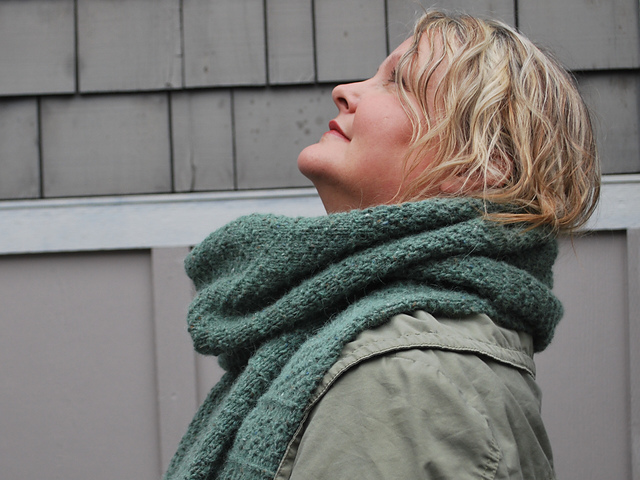 The Girasole pattern has gone very quickly and has been fun to knit. The yarn is lovely as well, and it certainly wouldn't qualify as torture to knit with it again. So maybe I'm not so close to finishing, after all. Lesson of the day: If your pattern calls for 1200 yards, and the skein says 400 yards - you had better have more than 3 in your stash!! To console myself while waiting for the phone to ring, I've cast on for Ludlow and worked the first 20 rows of moss stitch. It's quite a relaxing knit so far - just back and forth, knit and purl. Size 7 needles are giving me a fabric density that I like with the Felted Tweed, so I'll stick with that size. The gauge is about 4.5 per inch unstretched. It should easily give me the finished measurement without too severe a blocking. 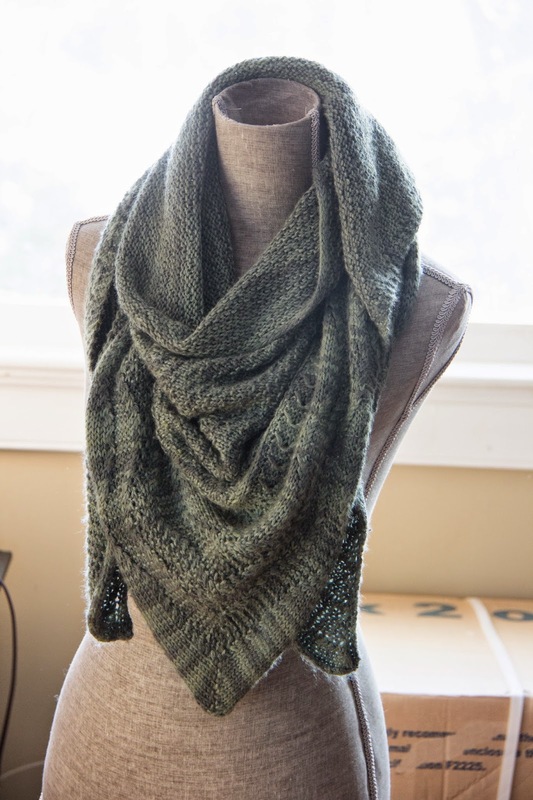 I hope you're all enjoying this fantastic rainy Friday - perfect for knitting, hot tea, and audiobooks! 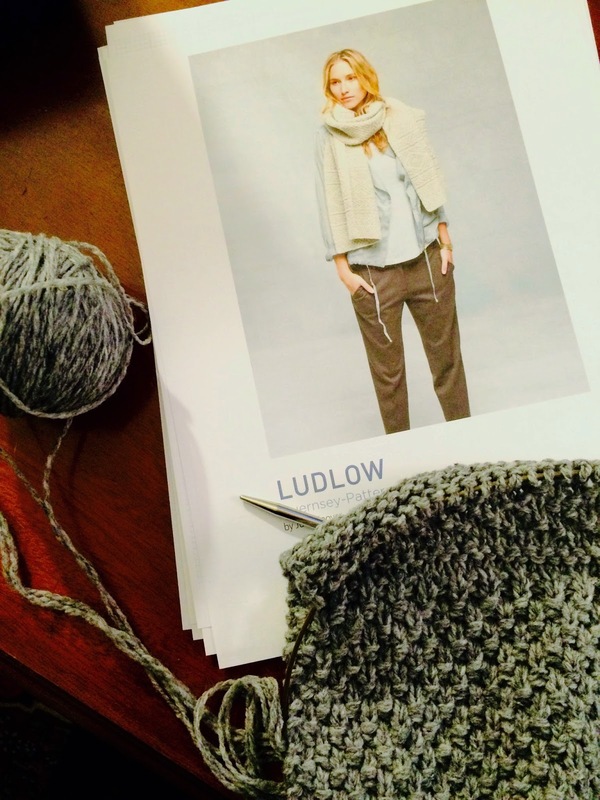 Just a quick post to let you all know that I quit Stonecrop and will now be knitting Ludlow instead. Knitting from charts is just a bit too much for me at the moment and I am feeling more comfortable with written patterns, also my yarn did not show up the pattern very well. 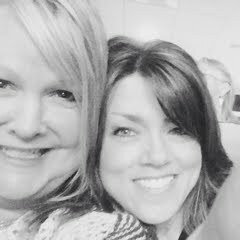 Carolyn and I had our photo shoot today, thanks to her hubby, Gordon. He's such a good sport. Streusels were a pleasure to knit. So much that C has started another. These were a KAL to celebrate "Girls in Sheep Clothing... and a few boys, too" 5-year anniversary -- back in July. We might be slow, be we're persistent. thanks for the ride Hawks...see you in Arizona!!!! To say I am indecisive, is putting it mildly. 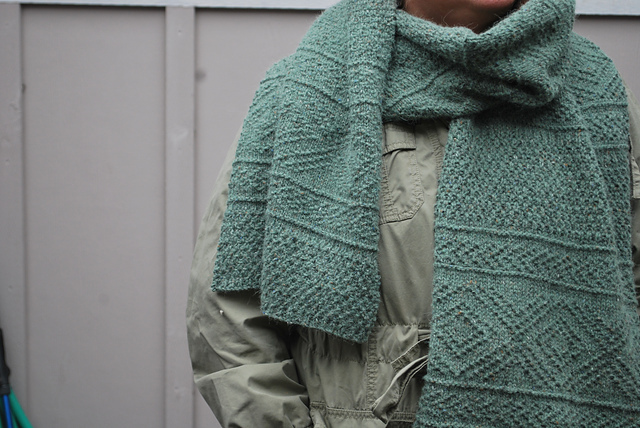 I was so thrilled when Melissa and Kelli announced the Floods Flock KAL! What a great idea! Yet, for someone like me, who has trouble making a choice, it can be agonizing. Initially, I decided to knit Stonecrop. I hastily ordered some Loft in Sweatshirt from Loop, in Philadelphia. Great customer service, by the way. It was at my door in two days! 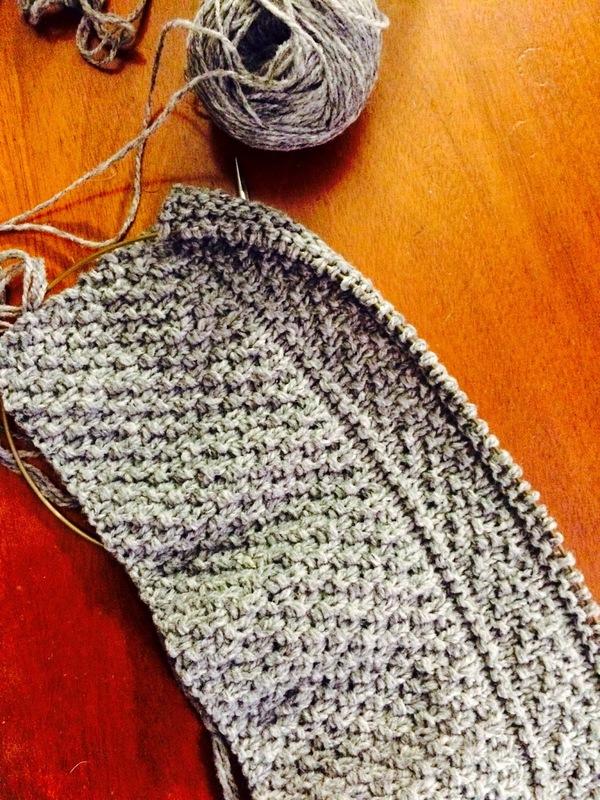 I wound the yarn and cast on with the zeal and glee that comes from a new project. But after knitting the bottom border, I wasn't thrilled with the fabric I was getting. Maybe I just like my lace to be a little lighter. Love the yarn, love the pattern, just not what my needles were producing. So, I stalled a little. Then, Kelli posted her gorgeous Ludlow!! I was in love! 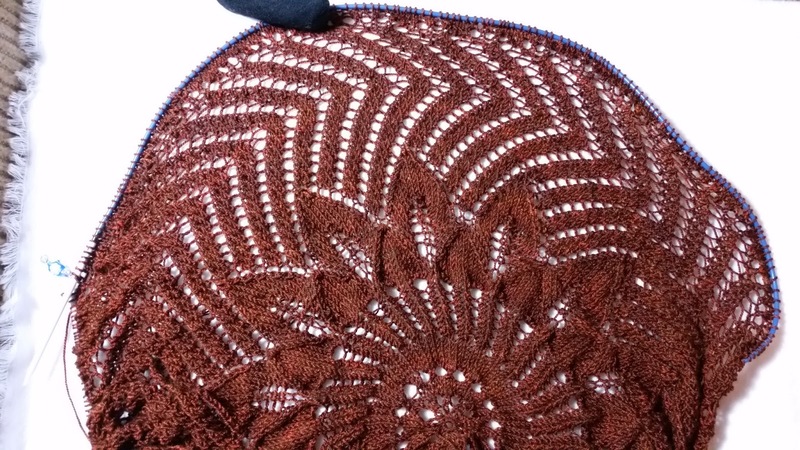 I had originally thought that was the pattern I wanted to make, but had chosen Stonecrop since I love lace. So, I ripped out what I had done, and immediately cast on for Ludlow! It's just the kind of knit I need right now. 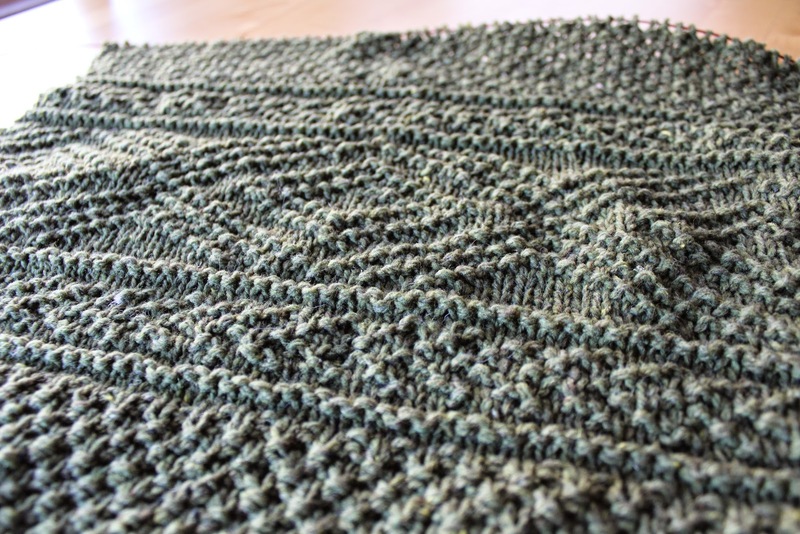 Back and forth, soothing knitting. I will also admit, I was not thrilled with having to keep track of two charts at once with Stonecrop. Probably for a time when my mind is not so scattered. Absolutely loving this project so far! Also love all the other projects I have seen so far! I am SO late to the party! I have good reasons, but more about that later. 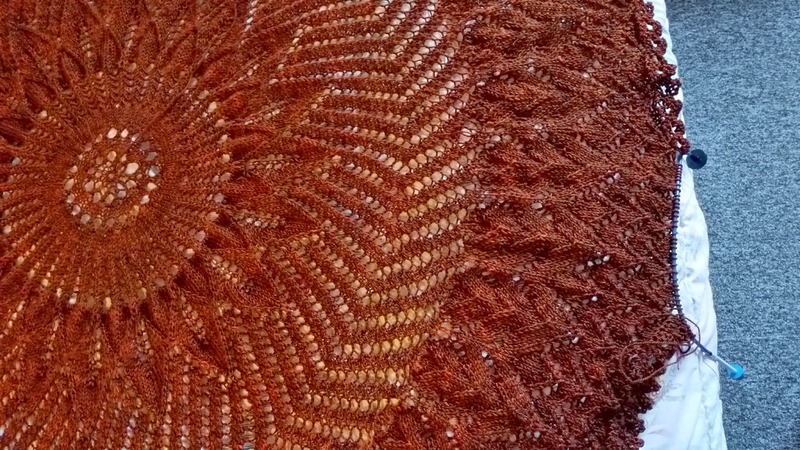 I'm working on the shawl version of Girasole, using Huckleberry Knits merino/yak/silk blend in the Browncoat colorway. It's a very lively tonal brown - not "flat" at all. It's a little redder in the picture than in real life. But, you know, one project is never enough. I was so impressed with Andrea's, Kelli's, and Shari's Ludlows at knitting last week that I decided to pick up some added "motivation" to finish Girasole. Once she's done, I'll be casting on for Ludlow in Rowan Felted Tweed. I'm thinking size 7s ought to do. I'll start swatching there, at any rate. Now, about those "reasons" I mentioned earlier! TPTB at my apartment community decided that last week was the perfect time to put new carpet in my apartment. So, I had to pack all of my things up to be moved out while the carpet was installed. 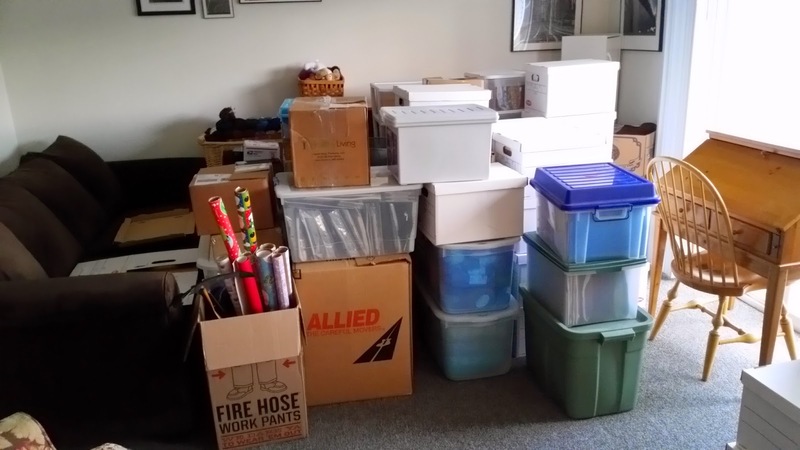 All the "fun" of moving, without moving. 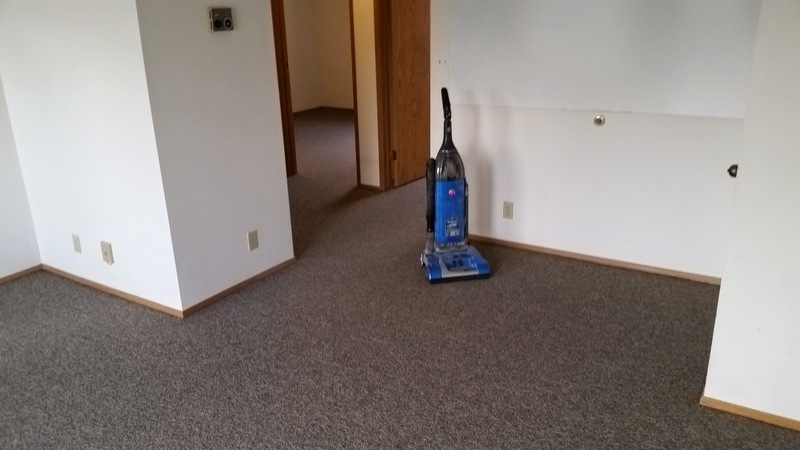 The new carpet is lower maintenance and a better color, but not very comfortable underfoot. I see rugs in my future! ...into this. (Notice Girasole ready for her close-up on the sofa!) 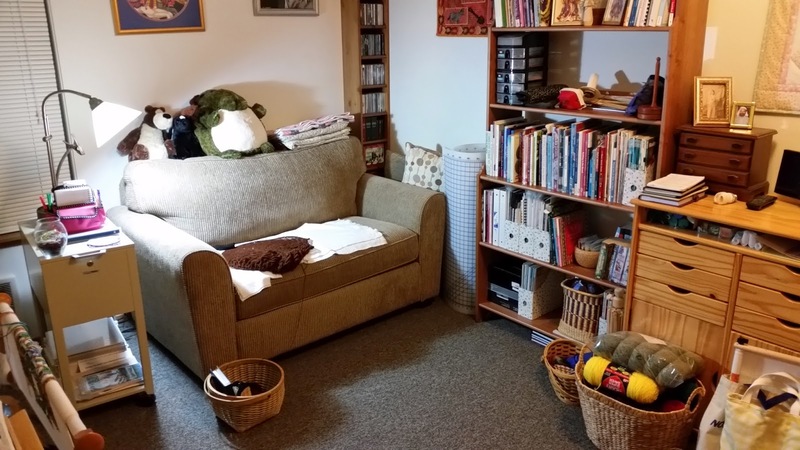 And that's just the stitching room. That was followed by a work conference in Portland on Monday and Tuesday. No pictures, but believe me, I'm doing you a favor in that omission! I'm looking forward to taking next week off and getting in some much-needed knitting time! Hopefully there won't be any more major events at home while I'm off. Getting new things is very nice, but I need a break. I decided to switch yarn for my Ashby. I love the charcoal but it was too dark. My eyes were getting very tired from straining to see the pattern no matter how many lights I turned on. I switched to another Berocco, Ultra Alpaca, in a washed denim color and the knitting is going much faster. I am on my second B chart (out of 5) but best of all, with this lighter color, I can actually knit while we watch TV in the evening. I am using a cable needle for the two stitch cables and I am feeling very confident now. Love learning something new! haven't try Guernsey, like Ludlow, put it on the list. We had a fun weekend on the ice! We got our fish house moved out there, and all set up. Love it up here in Mille Lacs, MN. 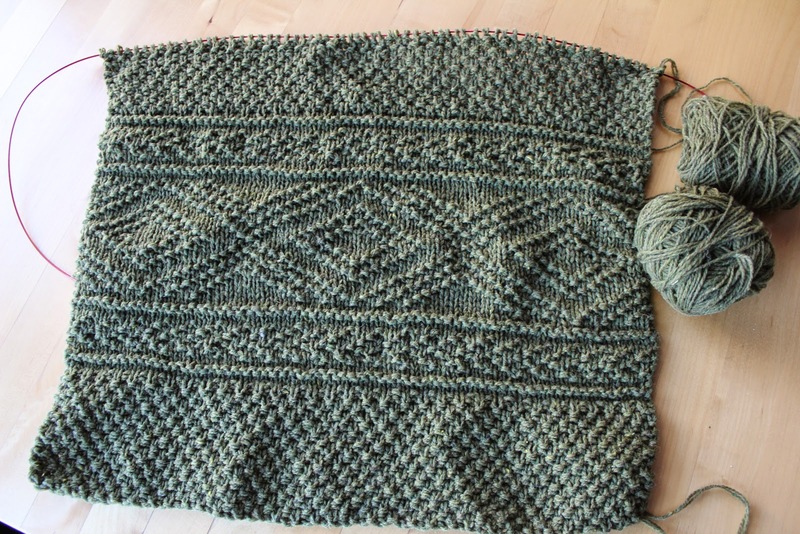 I know this post is heavy on Gnomes and light on knitting, but I did get quite a bit done, and am almost ready to make the turn on the border of my Ashby. Also, I wanted to remind everyone that there's still time to vote on the name for the gnome. edited by Mel to add the link for the voting : here it is! Tolt-R-Us... 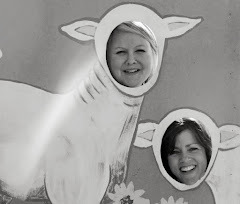 Guest Blogger Penny & Carolyn!